Rajasthan is the largest state of India by land area. It was founded on 30th March 1949. This state is also known as “Land of Kings”. The capital city of Rajasthan is Jaipur which is called as the pink city. The educational standard of this state is increased randomly. It is the home of various reputed engineering colleges such as IIT, BITS, RTU, etc. The average literacy rate of Rajasthan state is 66.11% according to the Census 2011. 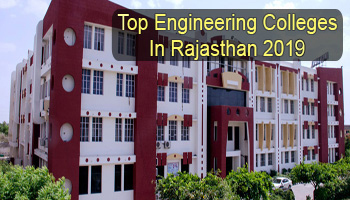 In this article, we have mentioned the list of Top Engineering Colleges in Rajasthan 2019. For academic session 2019, we have listed the top engineering colleges in Rajasthan. The list is comprised of several governments & private colleges/institution, including Indian Institute of Technology, Malaviya National Institute of Technology, Government Engineering College, etc. We have rated the given colleges on the basis of these factors such as education standard, teaching method and faculties, affiliation & approval, previous year placement records, infrastructure, campus facilities, student’s preferences, etc. For admission to B.Tech course, candidates have to apply for the national level engineering exam, i.e. JEE Main. This exam will also conduct for admission to B.Arch programme. Candidates will also apply for university level exams such as BITSAT, etc. The state will also organize a state level admission process on the basis of JEE Main score & 12th merit, i.e. REAP. For PG engineering courses, candidates should appear for GATE examination. In engineering course, candidates have an option to choose disciplines as per their preferences. There are many colleges which offer various specializations in engineering courses. These are Electronics & Communication Engineering, Aeronautical Engineering, Civil Engineering, Computer Science & Engineering, Mechanical Engineering, etc. If you have any other queries about Top Engineering Colleges in Rajasthan 2019, you can ask us by commenting below. Pacific univercity for b tech in dairy technology what is the rank ?